I thought about this from opening day at the theatre until release day of the DVD. Sam Raimi, Toby Maguire & company have delivered Spider-Man in an incredibly entertaining way for kids and kids-at-heart alike. The blockbuster success of the series is a testament to the respect they've shown for the comics and generations of fans. Yet, with the third installment, this superhero flick followed so many genre predecessors’ third outings by going campy. In what was supposed to be the darkest chapter of our favorite webslinger’s life, Emo Spidey was cheapened by Disco Pete and Bleeding Gums Parker, to say nothing of vibrating desks, annoying news correspondents, obnoxious kids, and a slow start overall. For Bruce Campbell enthusiasts, don't worry, his obligatory scene has been spared from cutting because, well, he’s Bruce Campbell. He offered the best levity in a movie that needed to be heavy elsewhere. I’ve tried to rework the opening so the film gets to the point faster and is clutter-free. The campier elements are gone throughout the film and some new ideas are tried so that you feel Peter’s descent as he battles the darkness within. This movie FEELS like it belongs with the other two now. - Mary Jane and Harry boogie while making omlettes. What I liked: It felt like a watchable movie. I was happy you took out the "He might still be alive" bit at the end with Venom. I liked what bit of goof and campiness you left in. No Spider-Man should ever be completely dark, because he just doesn't seem like that kind of character. Sandman seemed to make more sense to me as a character. What I didn't: Video quality, but that was a small thing. I had the AVI. There was some re-ordering that was a little confusing for a bit, but I don't mind it terribly since I usually prefer a movie that requires thought, just a small note there.. 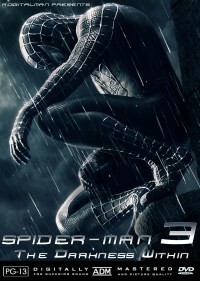 Overall: A lot of reviews seemed to think Spider-Man 3 should have no cheese or campiness, I can't agree. I also can't agree with you saying that now this movie fits in with the first two, because it seems to only fit the first one. The second movie is too much of a train wreck to keep up with your edit. To me it used to be the 3rd was so bad it made the 2nd seem okay but no longer! Really well done. I was very impressed that when the movie was over I found I had actually enjoyed Spider-Man 3! Extra: This edit would benefit from a re-encode from the source material. ut I also like this alternate version, which successfully removes the campiness factor. Watched an AVI version, no idea if the editor made it. Quality was ok but it looked oddly cropped. There were some awkward cuts here and there but overall it was well done. This version is better than the theatrical but still makes me cringe. I enjoyed the original version of this movie, but I also like this alternate version, which successfully removes the campiness factor. It’s not perfect, but very good. Imagine this edit combined with the Sandman-less edit. That would be interesting too. At any rate, if I ever get a hankerin’ to watch Spider-Man 3, this is the one I’d grab off the shelf. Good job as usual, ADM! I enjoyed this edit. You delivered on taking out the campiness. But Spiderman 3 still lets me down no matter how its edited. I cant stand how they did Venom. Just watched this over my girlfriend’s house with her. You did a great job at editing this movie, HOWEVER, there still remains a lot more to be cut. I’d give this edition a 6/10 in terms of Watachbility whereas the original gets about a 3/10. Flawless editing, great job.